The famous electric scooters are marketed as city dwellers by the manufacturer itself. 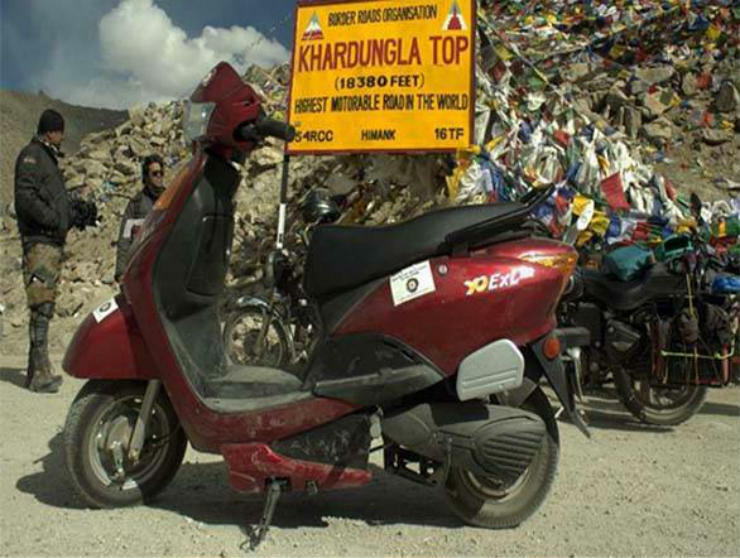 Two riders, Paras Loomba and Jaideep Bansal managed to take the puny scooter from Leh city to the mighty Khardung La. The scooters were not modified for the journey but inverters were carried to top-up the charge of the scooter. 65 per cent of the journey was covered using only 20 per cent of the charge. The electric scooters unlike the vehicles powered by combustion engine do not suffer through power loss as they do not rely on air density to produce power. The summit was conquered in just 12 minutes, which is as good as being covered by normal petrol powered two-wheelers. No one could ever thought the mere mopeds can be used for touring. Powered by a 69.9cc, 3 BHP, 5 Nm engine, the TVS Super XL has a fuel capacity of just 4-litres. Defying all the odds, the folks at Overdrive took two of them to the Nako Lake, one of the highest lakes in India. The 2-Stroke scooters did get some back-up to carry the fuel but there were no support given to the mopeds. The roads to mighty Spiti-Lahaul valley are known to be worse than the roads to Leh and the mopeds did a fantastic job of accomplishing such a feat. The Hayabusa is one of the world’s fastest motorcycles. Even though the motorcycle falls in the grand tourer category, the Hayabusa is not a easy motorcycle to handle. The dry weight of 266 kg makes the Hayabusa one difficult motorcycle to manoeuvre through mountains. The non-existent roads to the Ladakh region makes it even worse. The Hayabusa has low ground clearance and the 1,340cc engine of the motorcycle produces a maximum power of 173 BHP, which is pretty difficult to handle in such terrains. 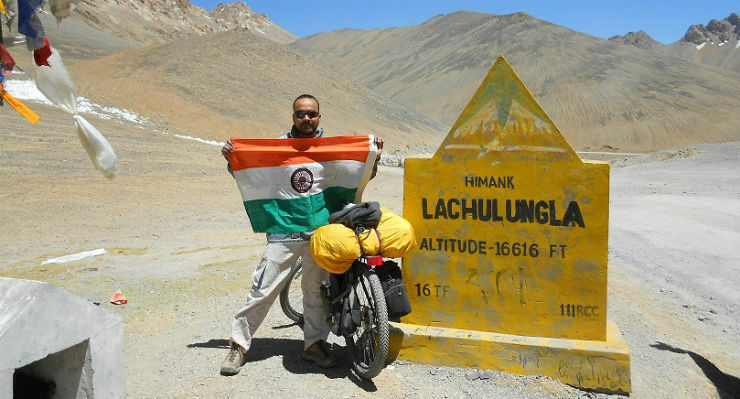 Jasminder Singh completed the ride from Delhi to Khardung La on the mighty Hayabusa. Pedalling all the way to Ladakh is very bold. The high altitude gives very low oxygen to human body and to pull your own weight with extra luggage can be a daunting task. This is something that cycling adventurers do many times. 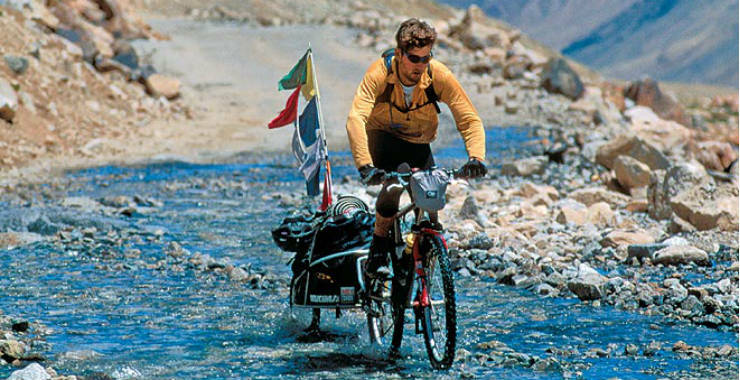 There are no isolated case of reaching Ladakh on cycles. Many Indian and foreign nationals take up this as a challenge to reach world’s most treacherous regions by pedalling. Anam Hashim is known as India’s youngest female stunt rider. The lady always dreamt of reaching Khardung La and when she did it, the world noticed. 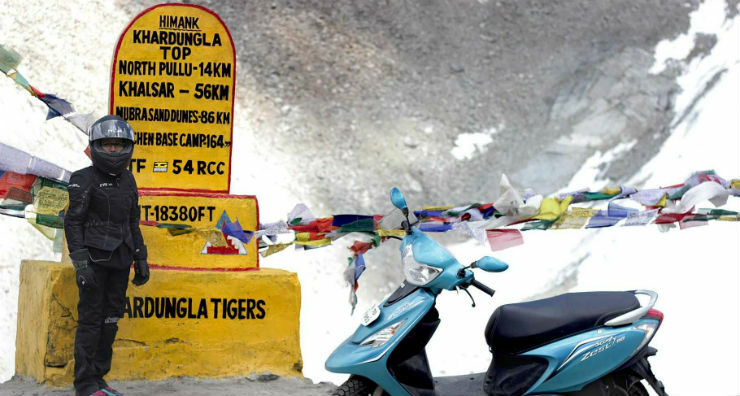 She took a meagre city scooter to the highest mountain pass in the world. The journey was covered on a TVS Scooty Zest which is powered by a 110cc engine and gets a CVT gearbox. The small engine produces a maximum power of just 7.9 BHP and that too does not operate in its full potential due to altitude. The lady rode the scooter solo to achieve her dream and that gives all of us a lot of motivation.